Answer: Sir Isaac Newton defined the kilogram operationally as: the amount of mass that accelerates at 1 m/s2 when experiencing a net force of 1 N. This follows from his 2nd Law: m = F/a. This will never change. The quantitative definition of the kilogram was originally based on a 1795 convention that the mass of 1 cm3 of pure H2O = 1 g. Since 1889 it has been defined by the international prototype kilogram kept at the International Bureau of Weights and Measures in France. This may soon change. Those two definitions connect dynamics to metrology, allowing mass measurement in a weightless environment — like on the ISS. 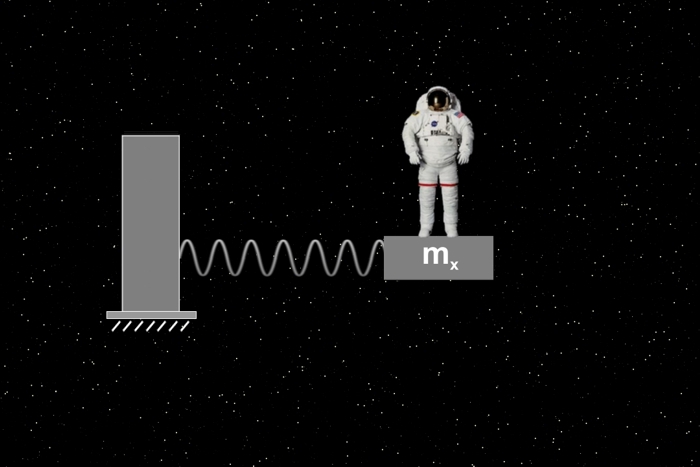 In its simplest form, you apply a known force (in N) to the unknown mass and measure its acceleration (in m/s2). With that, you can calculate the mass (in kg) using Newton’s 2nd Law. Of course, this requires a mechanism that can apply calibrated forces, and an instrument to measure acceleration. where T is the oscillation period in seconds, and k is the spring constant in N/m. Amazingly, T is independent of the amplitude of the oscillation (for small displacements from equilibrium). So even when using a “real” spring where the oscillation slowly decays to zero (unlike my animation), you can still get accurate mass measurements. NASA uses a different approach. 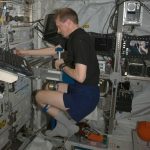 The thumbnail below shows the SLAMMD (Space Linear Acceleration Mass Measurement Device) in action on the ISS, where an astronaut is measuring his body mass. Note that astronauts don’t really “weigh” themselves — they mass themselves. Click to enlarge. SLAMMD uses Newton’s Second Law by having two springs pull with a constant known force against a crew member “attached” to an extension arm. The resulting acceleration is measured electronically, and the calculated mass is displayed on a digital readout. SLAMMD is accurate to about 1 kg over a range spanning 40-110 kg. Crew members on the ISS measure their body mass on a routine schedule, along with other vitals. We’re still learning about the long term affect of weightlessness on the human body. One thing we’ve already learned is that, without regular exercise, astronauts lose both muscle mass and bone mass.